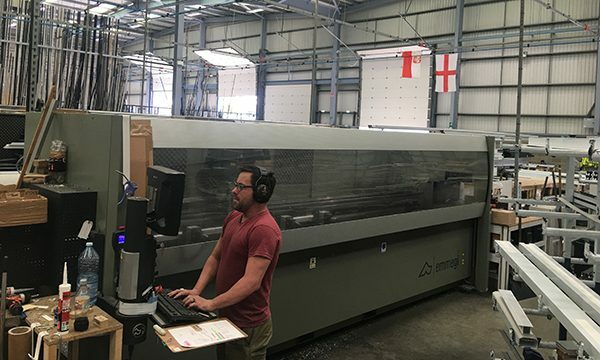 Garrard Windows has added a sixth Emmegi machining centre to its aluminium fabrication set up, confirming the Coventry based specialist as its first choice machining centre supplier. Garrard now has three Emmegi T3A three axis machines in its Pitstone factory, alongside three Emmegi Phantomatic M3 four axis models and two Itaca Solution NC controlled crimpers. Steve Leek, Garrard’s Joint Managing Director, says that, partnering with one supplier on machining centres has helped Garrard to achieve consistency and reliability right across its aluminium range. He said: “As you can tell from the fact that we keep on buying more, these Emmegi machines do exactly what we need them to do – day in and day out. We started out with a machining centre from a different supplier, which proved too slow for our needs and not very user-friendly, so, when our rental agreement on that came to an end, we bought a T3A from Emmegi instead and haven’t looked back since. “We like the fact that these machines are easy to set up, easy to operate and never give us any trouble. With the volumes going through our factory and the demands of our trade customers, we need to know that we can guarantee our output at all times. Garrard Windows largely uses the Emmegi machining centres for the hinge and lock preparation on its range of aluminium windows, doors and bi-folds in the Smarts and Liniar Aluminia systems. They are split between the company’s two adjacent 43,000 sq ft factory spaces, one of which is dedicated to aluminium and one to PVC-U.